I’ve been trying to build a liveset for a while now, and I think I am stuck in a “paralysis by analysis” situation of not knowing exactly how to set everything an be satisfied with how I play. I’ve worked on two types of set for the moment: one based on the octatrack which was mostly an upgraded DJ set of my own tracks, with added loops, drums with a volca sample, sends to a delay, and it was fun but it felt a bit too much like “cheating”, so I worked on another one based entirely on patterns only on the digitone which was super playable but not very open to tracklist change, and did not allow me to play my tracks live. What do you think of “upgraded DJ set” live shows? How much do you prepare? How much do you do on the spot? What do you think of the “improvised techno” movement? I’d really love to know your approach! I use 3-4 sequencer synths to mix and alternate parts: AR, MD, Circuit Mono Station and (only a little) MM. And FX. No recorded stems. I’m a synthesist, not a sampler/DJ. Only did one live gig with this setup so far, but lots of jamming at home. I like the relative freedom in mixing and blending parts, though it’s certainly not complete free improv. The happy accidents occurring (firing the “wrong” pattern and getting an unintended mix, or calling up the “wrong” FX preset) can be fun too and lead to new musical routes. It’s much more prone to error than using pre-recorded stems, but I’ve been complimented with the surprising dynamics of the set. Part of my philosophy is that risk, tension and effort bring valuable qualities to the music. To be honest to myself, and find the best way to express myself. If that means playing a long sample, then so be it. You never know until you’ve tried it. Both. The better you plan, the easier it will be to improvise. Knowing your equipment inside-out is an essential part of this. A lot of improvisation is not much more than muscle memory. 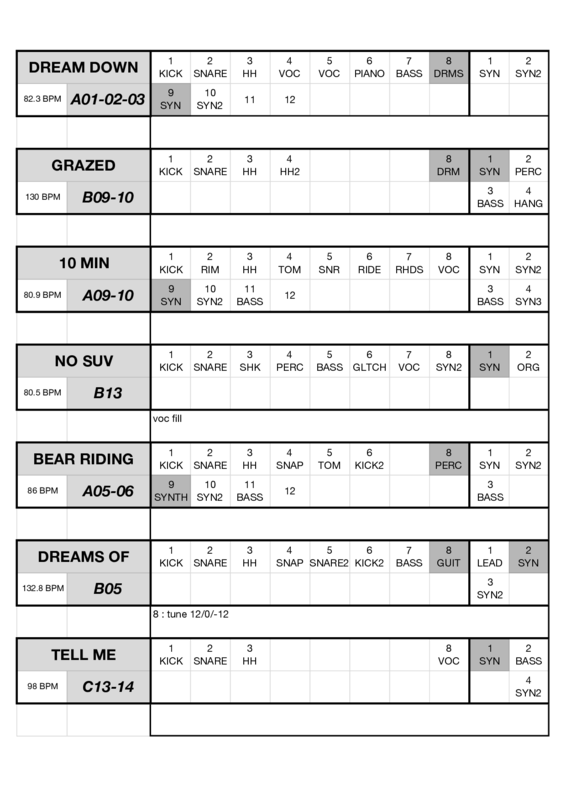 I often set up an “environment” (specific gear in a specific configuration) to improvise within, but have ready made loops for the start of the set; then once I get going I can ease into improv. That also means that I can go on forever; some times that is required, believe it or not. I also have a “pause” sample, about 10 minutes long, for when something goes wrong. It will keep silence at bay while I figure things out. Never had to use it though. Apart from that, Ilike to break my own rules and challenge myself, sometimes both. I’m using the Rytm, M32, 0-Coast, El Cap, AH, and RNC for my current live setup. I prepare patterns to serve as a basic starting point, then start messing with things as tracks progress. To avoid confusion, performance and scene modes on the Rytm have a well defined layout that never changes. Filter sweeps on pad 1, pitch down on pad 2, that sort of thing. I’ll write down the modular patch and knob settings on a post it note, along with each tracks tempo and what pad should start. It’s a really fun setup that can descend into controlled chaos whenever I please! I use 8 hardware synths through Ableton, all clocking through an ERM. I set up each machine on pattern 1 and create a loop, then do the same on patterns 2 - 16. So I’ll have 128 patterns. I then press play and use the internal effects on my machines, or send effects in Ableton to transisiton between patterns. I find in the planning stage I spend a lot of time going back and forth between patterns to make sure the sounds compliment each other so I get a smooth transition when changing patterns, sometimes I fade out/change/fade in, other times I got for a direct change. I also use an external midi controller to control send effects and volumes in Ableton. When I actually play live, I tend to start with a plan but generally improvise with what patterns I use and how I transisition. I also program on the fly to add variants to my already pre-programmed patterns. I also tweak, mix and write on the fly. I tend to add and remove drums more than I do synth sounds… I tweak synth sunds a lot but also use non linear LFO’s to add variantions over time to my sounds. I use e2s with a bunch of empty patterns that I will improvise with. All my samples are drum sounds, one shot instrument samples or single cycle waveforms. I have model:samples with a super similar sample set synced running through Organelle then into e2s then to an RNC which I just got in my setup. Everything is improv. I do a huge amount of prep to get something new when I play and practice often. I try to go in with some ideas for the general composition, but I never know where we will go! It is an amazing feeling and have been performing for a few years now. mine are built around hardware sequencer of certain type (like Yamaha RM1x / E-Mu Command Station / Roland MC-80 that i own, or Squarp Pyramid that i want), where a project is a chain of multitrack patterns that can be easily rearranged on the fly. so, i either manipulate with track structure in realtime, or tweak something over a looped pattern, or do live percussion improvisation over a looped pattern. two machines, one input device. mixer never operated during live set, all settings are stored in mixer presets and recalled by a single button touch — very convenient. update 2: of course, i keep computers/laptops away from the stage. they are unreliable, i have seen a lot of crashes of all major desktop platforms, including Linux and Classic MacOS, but very few crashes or hangs of hardware synths. One, maximum two boxes, no external gear, no mixers. Practice, practice, improvise on top of a basic, skeleton pattern. Move slow, introduce changes slowly. It all depends what I’m going to be doing and with who. I rarely play all by myself. Usually stuff is rehearsed / planned in advance, I don’t like to improvise that much unless I have to. IMO 100% impro can be a bit boring for the audience, thats what jams are for innit? Oh well, there was this one band that was based on 100% improvisation where I played some shows, you never knew how each gig would go in advance… Guess it wasn’t all that bad. What is an “upgraded DJ set”? As someone who also plays gigs as a turntablist, I would like to know what this means… Yall consider DJ sets to be something specific (less than playing live) somehow? 2x Synthstrom Deluge, 1x AR, 1x Roli Seaboard Block (+ iPad Mini). Yall consider DJ sets to be something specific (less than playing live) somehow? I consider it a different genre of electronic music performance. Not more or less. Generally DJ’s will (re)mix other artist’s work while ‘live’ artists only play their own compositions. I’ll value a creative and characterful DJ set much more than a bad ‘live’ set with sequencers and all that. I think when people say upgraded or hybrid DJ set they mean a performance combining DJ style mixing of recordings with ‘live’ sequenced and triggered elements: synth/drum/sample patterns and so on. I don’t think there are necessarily clear, binary boundaries. Though there’s a huge range in performativity within DJ sets, just as within ‘live’ sets. In both there are examples that I would barely label as a live performance. What I call an “upgraded DJ set” is a live configuration where the artist will mix his own tracks like a DJ would, and using other tracks to maybe play loops, drum machines, synth on top. Some artists call that a “Hybrid live/DJ set”, you could also think of Surgeon’s setup in the 2015 Boiler Room of his where he DJs in Ableton and layers a modular synth on top of full tracks. I think Recondite and Four Tet have a similar approach too. No judgement about it at all, I did it too, it’s just part of the Spectrum, and I can understand why you would do that when an arrangement is very difficult to reproduce in the context of a live show. i’m not much of a musician in the traditional sense, so in my limited perfomances up until now have been basically stemming my tracks and the live “performance” part of it has just been triggering scenes and dub mixing it all. So part of the reason I bought a Digitakt was to be the brain of a more gear centric setup to allow me to do something similar, but with a lot of it being generated live and lots of flashing lights so eventually I can have camera filming what’s going on and make it a bit more visually interesting. The plan is kinda play a chunk of a track as it was recorded, and then start dubbing and rearranging on the fly for a bit. I’m currently planning my own custom teensy MIDI controller to make this all work… hoping I don’t have too many latency nightmares using ableton to mix it. Definitely interested in using the DT in a more experimental improvised way as well though… have a more art related opportunity to do that coming up which I am excited about. ahh okay so just a synonym for “Hybrid DJ set” then I guess. And there are genres where DJing your own music is more common than in others, like in DNB/jungle, rap etc… When done the right way I feel it can be just as appropriate as any other approac for gigging. I’ve been slowly building a live set for quite a while now. The type of structure I gravitate most towards is to have the main-focus elements like the percussion or synths being generated live so that I can mute/unmute or tweak whenever I feel like it, but at the same time have one or two loops running in the background. Usually I record some cycles of the main elements along some additional noise and send it all through delays, overdrives, EQ, etc. Then I use these loops as background texture. Nice to have these texture loops for filter sweeps or transitions between songs. Since people talk about all this hybrid DJing, maybe one could also classify this as a hybrid technique, but more among live-performance side of things. I’m playing my first solo live set tomorrow. My setup is pretty compact: Digitakt into Digitone, and I will also bring a microKorg if I feel like playing some lead parts. I play downtempo/hip-hop music. 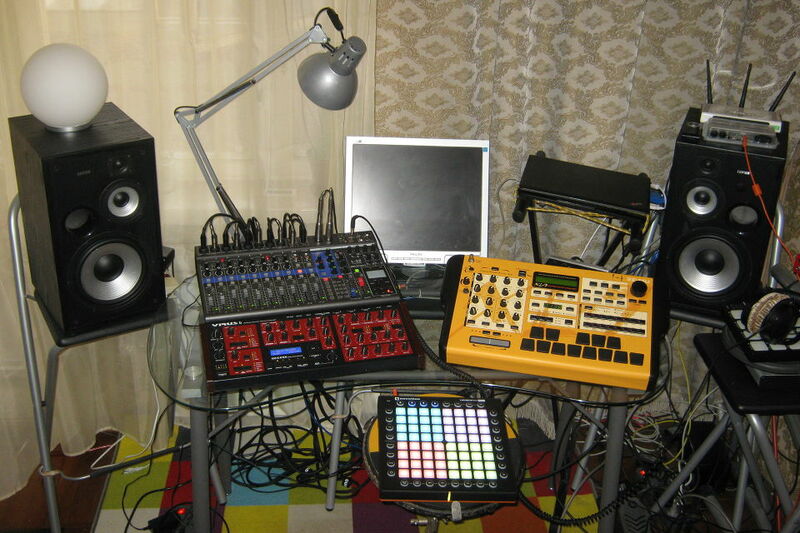 Some tracks were originally composed with this setup and some tracks were entirely composed in a DAW. For the latter, I loaded loops (bass guitar, vocal samples, … ) and reprogrammed the drums into the Digitakt, and re-did the synth parts on the Digitone. Both. The better you plan, the easier it will be to improvise. Knowing your equipment inside-out is an essential part of this. Sure, I agree too, improvising takes a lot of preparing and practicing. I meant pre planning more in the sense of having a set list and knowing wich melodies you’re going to play, as opposed to going in with just say a pool of sound and Template in your octatrack.